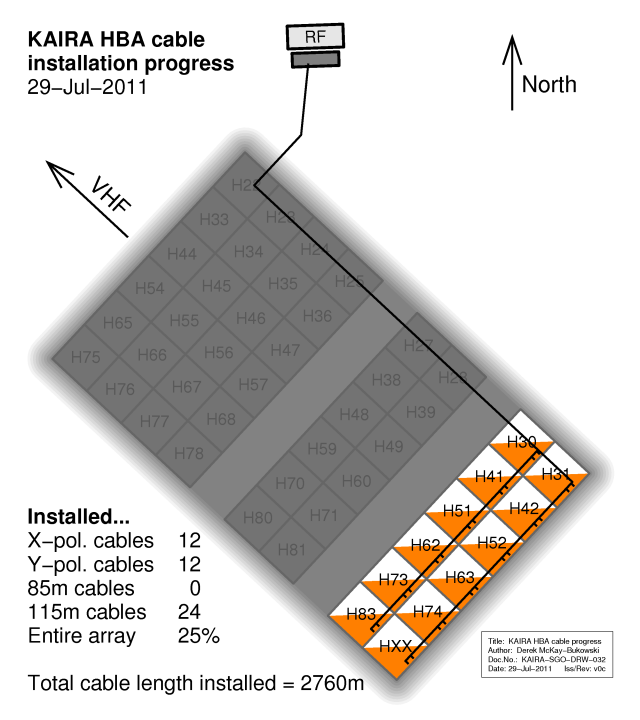 Today, we continued work on the HBA cables. With not quite as many people on site today, some additional work to be done and some planning and checking, we did not get quite as many done. However, we have now completed the first block of cables and are ready to go with the next block for Monday morning. As far as our revised schedule is concerned, this is on track. The completed antennas are shaded in orange and white. This is because these are the colours used on the labels of the X- and Y-polarisations (respectively). During the weekend, we shall be working on the planning for the next stages of the build. Apart from organising the electronics for the RF container, there is the initial planning work to be done for the LBA. It is almost a year ago that we carried out the first site survey and that was planned last August. So, it is time to get working on the planning for the LBA build for next year. Oh... and the weekend will be a great chance to catch up on all the unpublished photographs we've been taking for the web log!